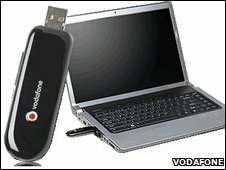 A survey by comparison site Broadband Expert suggests that UK mobile broadband providers are delivering services "far lower than advertised". However, some experts queried the results, saying that quantifying mobile broadband was almost impossible. Rob Webber, Broadband Expert's commercial director, explained how they did the tests. "These are tests performed by users on the Broadband Expert website. They select their internet service provider, their promised connection speed, and the sort of connection they have. "As a result, some providers got tested more than others and we did not have enough data on British Telecom or Virgin Mobile to give a valid result," he said. Mr Webber said that mobile internet service providers should advertise the average download speeds, rather than the maximum possible speed. "Advertising this way will not help the long-term growth of mobile broadband or the reputation of the providers if customers feel they are being misled," he said. But Ian Fogg, an analyst with market research firm Forrester Research, said that there were so many variables involved with mobile broadband an average speed comparison would be "meaningless". "While an average comparison of home base broadband [ADSL and Cable] has some merit, it just isn't practical for mobile internet," he said. "People move - that's the whole point of mobile broadband - and their physical location will have a huge bearing on what sort of connection they will have. "They may have a good or poor signal, which will instantly affect connection speeds. Then there is the type of connection, a rural network may still be an a 2G network with speeds, at best, of a few hundred kilobits. "And, of course, there is time of day. The number of users on line using a network makes a far bigger difference than on home base broadband," he added. Vodafone, who had the lowest percentage of advertised speeds according to the Broadband Expert survey, issued a statement saying that "reliability and consistency were more important to customers than speed". "We've been careful to communicate what customers will typically experience from mobile broadband and give examples on our website to show how long a presentation, image or document will take to download using 1.2Mbps," the statement read. Mr Fogg said it was hard to compare different mobile ISPs in a meaningful way. "There is no easy way of marketing the speeds that would fit into a headline," he said. "What networks are saying is that their infrastructure is being upgraded and so are giving the highest peak speed that their network is capable of."